Add a networkinterface to your computer via USB. Common uses include adding wired networksupport to Chromebooks and Android tablets, improving speeds vs. 10/100adapters and wireless networks, replacing a broken internal network card,adding a separately routable network interface, and transferring filespeer-to-peer over Ethernet. It is not a solution for connecting a USB devicelike a printer to a network. Plug into any USB 2.0 laptop or desktop currently limited to 10/100 Ethernet,and benefit from faster transfers on your Gigabit ethernet network. USB 2.0supports theoretical speeds up to 480Mbs. In practice, most machines will seeup to a doubling of network speed by moving from 100Mbs Fast Ethernet to1000Mbs Gigabit ethernet via USB. Also works on 10/100 ethernet networks attheir native speeds. Microsoft signed 32/64-bit drivers for Windows 10, 8.1/8, 7, Vista, XP, 2000,ME, and Win98SE. Not compatible with ARM-based Windows (MS Surface). Mac OS X10.6+ 32/64-bit requires latest driver via download. Linux kernels prior to 3.3require rebuild of kernel module from source. Not compatible with Tivo Series2, or Wii. Works using built-in drivers (no install needed) for all Google Chromebooksystems, Google Nexus Player, nVidia Shield, many Android systems, and systemswith Linux kernel 3.3 and higher. 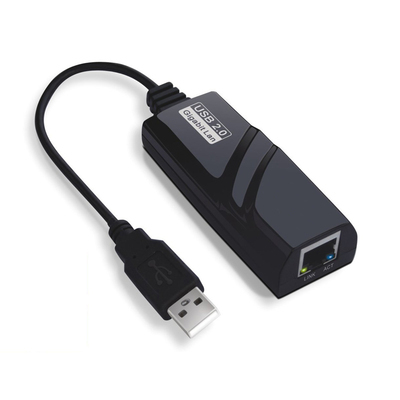 USB 2.0 to Gigabit Ethernet Adapter with standard USB type A connector to PCand female RJ45 jack to network, Quick Install Guide, and Driver Disk forWindows and Mac.